The new addition to the ARO portfolio offers a conductive PVDF wetted 1-inch and 2-inch port sizes driven by the EXP pneumatic motor technology. Showcased at the recent Hannover Messe Pump trade fair, the 1- and 2-inch pumps are the latest addition to the EXP range of process and automation-ready diaphragm pumps. They are designed for fluid management involving highly corrosive fluids transfer in hazardous duty environments like chemical processing, pharmaceutical, agrochemicals and general manufacturing. The new addition to the ARO portfolio offers a conductive PVDF wetted 1-inch and 2-inch port sizes driven by the EXP pneumatic motor technology. Compared to machined conductive polytetrafluoroethylene (PTFE) solutions, the new pumps offer similar explosion protection, the same tier chemical compatibility and a leak-resistant design. The features of the new conductive EXP pumps include stainless steel hardware and inserts reinforcing the plastic structure of the pump to reduce leakage. 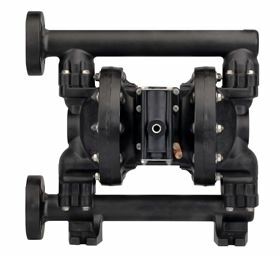 They also feature flow rate and leak monitoring combined with remote actuation features and are lightweight due to the lower density of the PVDF material. The company says the 2-inch PVDF pump is up to 60% lighter than a similar pure PTFE pump.